Although nuclear power plants are being built in Asia, they have not been ordered in the U.S. since the 1979 accident at Three Mile Island. For many reasons, new attention is being given to light water reactors. Currently- operating nuclear power plants in the U.S. were built under rate-of-return regulation. Now, new nuclear power plants must compete in power markets. This paper models the net present value of building an Advanced Boiling Water Reactor in Texas using a real options approach to determine the risk premium associated with net revenue uncertainty. It finds that a cost of about $1,200 per kilowatt-electric (including financing costs) for advanced light water nuclear power plants could trigger new orders. On the other hand, owner-operators might be willing to pay higher prices for nuclear megawatts if methods for mitigating price, cost, and capacity risk through contracts or real assets could be found. 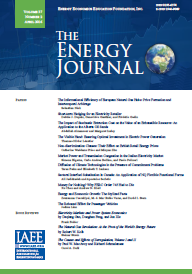 Published in Volume 27, Number 1 of The Quarterly Journal of the IAEE's Energy Economics Education Foundation.